A 36 page, soft cover, full color, children's book, with perfect binding. 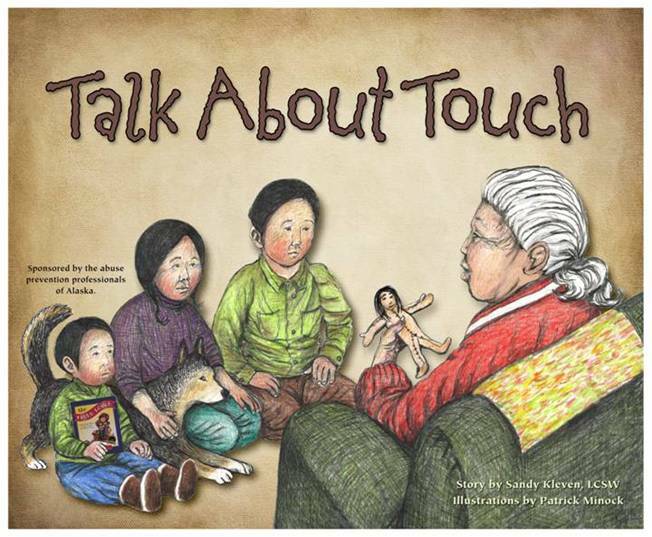 Written by Sandra Kleven and illustrated by Patrick Minock, published in 2012, by Illumination Arts, Inc. A sexual abuse prevention lesson set in a rural Alaska village. A small book against a big statistic. Author Sandy Kleven has a long history of work in rural Alaska as a children’s clinician. She’s the author of The Right Touch and writer for the Emmy Award winning docudrama, “The Touching Problem.” She is a licensed clinical social worker with an MFA in creative writing. Kleven has seen how children respond to the prevention message through her experience with The Right Touch. When parents teach preventions, children know where to turn when something happens. If they have been victimized, the story supports the child in telling a trusted adult. Illustrator Patrick Minock, is a well-known artist whose work captures the feeling of life in Alaska Native villages. One reviewer says that his pictures are "all beautiful and draw you into the picture as if you are not looking at it but actually a part of it."